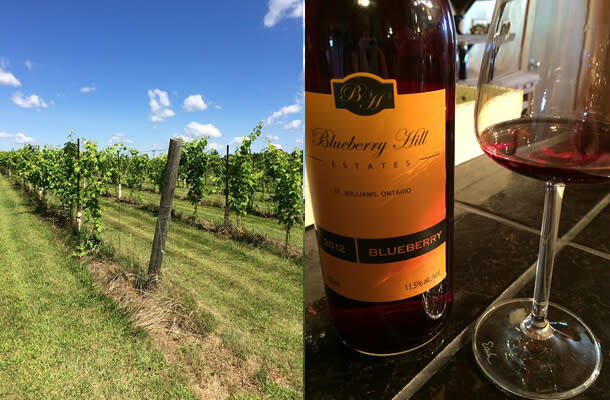 What follows is blogger, Krista Lamb&apos;s account of her trip touring Ontario&apos;s South Coast Wine Trail. 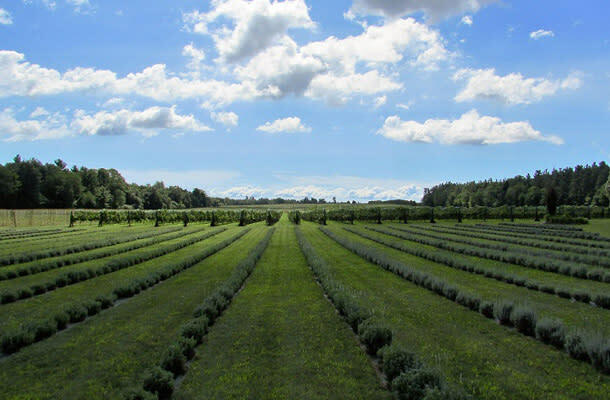 Shawn and I are walking through the grounds at Bonnieheath Estate Lavender and Winery on a beautiful August afternoon. We pass the regal old oak tree, meander past the prairie grass, the wetlands and the rows of grape vines and lavender plants. It’s hard to believe that not long ago, this beautiful oasis was a tobacco farm. For owners Anita and Steve Buehner, I sense relief that they have been able to move past those tough years, when the tobacco farm went out of business and they didn’t know what the future held. Now, with a retail store stocking their wines, cider and lavender products, with a beautiful patio overlooking the fields and a wedding-ready gazebo, Bonnieheath is bursting with potential. Potential is a word that comes to mind often as Shawn and I visit Ontario’s Southwest (as guests of their tourism association). The beauty of the area is undeniable – fields of green line the highways and the local produce is flush with flavour and freshness. Amidst those crops of corn and berries, winemakers have started to pop up, first making fruit wines and now many of them adding hybrids and vinifera to their crops. The wines of Ontario’s Southwest are still in the early stages, but the area is emerging as another viable area for winemaking in the province. We begin by tasting through the wines at Bonnieheath – the Marquette and lavender icewine are the most impressive and the Don’t Count Your Chickens white blend is a refreshing surprise. They are concentrating on hybrids, as their terroir suits it best. I’ll hear a lot about the unusual May frost on this visit, which wiped out most of Bonnieheath’s apples and was a reminder of how challenging it is to grow vinifera in Ontario or other cool climate regions. They are also concentrating on cider—the last bottling is all sold out, so Shawn and I sip tank samples and can see why it’s so popular. It suits Bonnieheath and I suspect it will once again be a big seller. 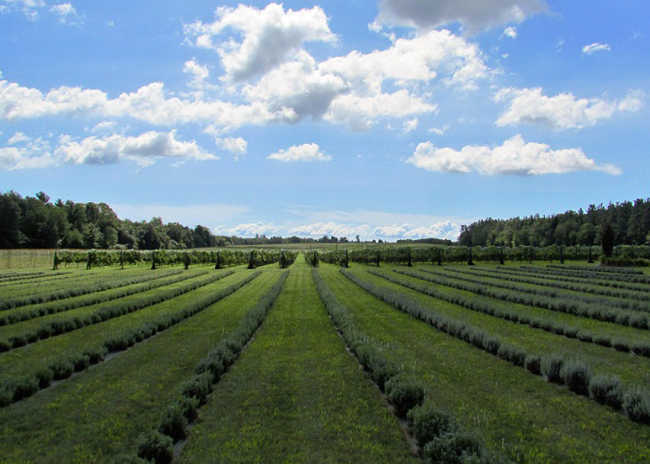 From Bonnieheath, we turn the car towards Blueberry Hill Estates, where we meet with Amanda Allison for a tour of this meandering blueberry farm. They grow 13 different types here, and sell them at their on-site farmers market. They also sell some of the best blueberry and butter tarts around. Their café is set to open soon and they continue to add animals to their growing farm. But it’s the wines that have brought us here and we’re excited to taste. Fruit wine has a bad reputation amongst the wine snobs of the world, but I’ve always felt it has its place. Blueberry Hill has decided to turn that reputation on its head. Like Muskoka Lakes and its cranberry wine, Blueberry Hill has concentrated on what it does best – blueberries. And the blueberry wine is good. It’s drier than you’d expect, but still holds the character of the berry. They age it in oak barrels and it’s made with an abundance of love and care. We liked it. We also liked their late-harvest blueberry. A perfect addition to sparkling wine or as a dessert tipple, it’s just the right level of sweetness. Their other wines are flush with potential – the fruit wines taking things to another level and their excellent new cider, The Fighter, more than holding its own in the product line. From there, we head towards our final destination for the day, Port Stanley, with a stop at Quai Du Vin Estate Winery along the way. Here, winemaker Jamie Quai is walking a group through an hour-long tour of his winery. His enthusiasm for winemaking is infectious, as he goes through everything from the basics of wine to the details of his own grape-growing philosophy. Afterwards, he walks us through a private tasting on the winery’s lovely patio, as a wedding is set up on the beautiful grounds just beyond us. It’s hard not to fall in love with this landscape, and Shawn is won over by the lone frog holding court in the patio pond. The wines here are a mix of hybrid and vinifera. The hybrids grow (and sell) well, which allows Jamie to make the vinifera he enjoys. He has a wide range available, from a sweet and slightly carbonated 2013 Aurora Muscat Petillant to a refreshing and balanced Vidal (perfect for summer). He alternates between dry and off-dry Riesling, depending on the growing season, with good results. The reds are strong. While I have yet to develop a taste for most red hybrids (Baco Noir and Marquette being the exceptions thus far), I can see that great care went into all of these wines and why they work so well in this market. I’m impressed by how Jamie is making both side by side – he reminds me a bit of the winemakers of Prince Edward County, with his experimental nature and intense passion for making wine that is expressive of the region. After a day of sipping and spitting, Shawn and I are ready to relax and enjoy a good meal, which our host for the evening, Windjammer Inn in Port Stanley, is well-equipped to provide. Our room, The Sheppard Suite, is spacious and comfortable, with a large en-suite bathroom and a nice sitting area at the end of the bed. We have a reservation for dinner and I can’t wait to tuck into Chef Kim Saunder’s renowned cooking. Dinner does not disappoint. While sipping Ontario wine, I enjoy into flavourful crab cakes followed by summer ricotta gnocci with shrimp and scallops. Shawn is impressed with the melt-in-your mouth bison tenderloin carpaccio appetizer and his eyes widen when his large, succulent pork chop arrives. Finishing off with delicious desserts (a crepe for him, crème brule for me), we are more than satisfied as we set off for a much-needed evening walk of the area. 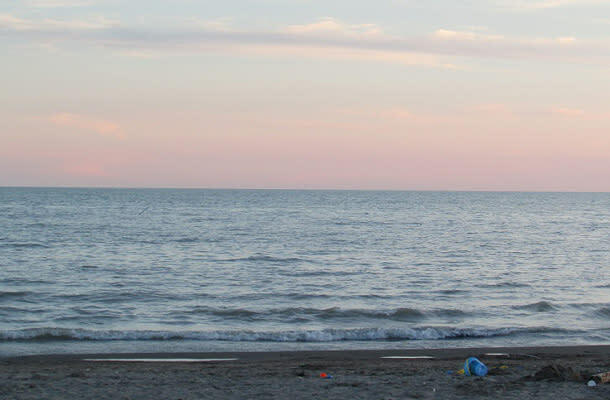 Located on the shores of Lake Erie, Port Stanley has a wealth of sandy beaches and a bustling main street lined with cute shops and busy restaurants. We watch the sun set from the beach, then walk over to explore the main drag. Though the shops close somewhat early, the bars are wide open and many feature bands or singer-songwriters, whose music fills the air around us. This is not a city that heads to bed early on a Saturday. Shawn and I, however, are ready to turn in and are grateful for our comfy bed at The Windjammer. 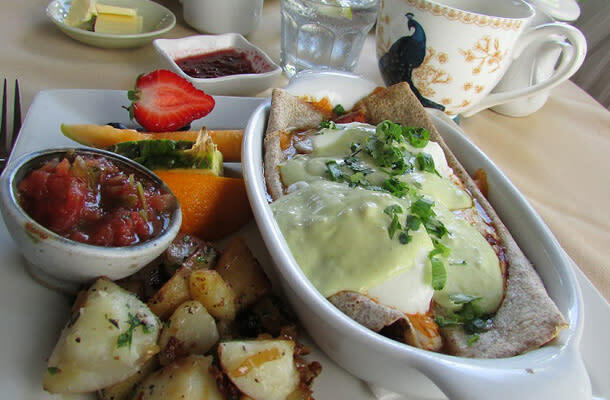 We wake early and at 9 a.m. head downstairs to tuck into breakfast on the sunny patio, just as it opens. If possible, this meal is even better than dinner. There are fresh-baked scones to start and I enjoy the Huevos Mildred while Shawn devours the farmer’s breakfast. It’s a filling start to the day and the fuel we’ll need for the rest of our adventures. We start our day visiting The Historic Village of Sparta, which is full of artist’s galleries and antique shops. Exploring the seemingly endless rooms of Anything Used & Sparta Country Candles we can’t resist buying one of their popular candles and picking up a few odds and ends to bring home. From Sparta, we head back to Port Stanley, which is finally waking up. The shops are open now and we pick up local fudge and I find an adorable dress at The Bodhi Tree. We spend a few hours just wandering around exploring the stores and beaches. For lunch, we decide to split fried green tomatoes and local perch at The Kettle Creek Inn (all of which paired perfectly with a glass of Cooper’s Hawk unoaked Chardonnay). Eating in their pretty gazebo on a sunny Sunday is a pretty perfect way to end our visit to the city. On the way home, we pop into Rush Creek Wines (closed for a family emergency) and then set out to find Golden Leaf Estate Winery, where winemaker Andrew Shelswell is happy to show us around and let us taste through some of his recent releases. After making wine in Nova Scotia for many years, Andrew has had an interesting transition to Ontario. With a base of mostly sand and a very high water table, the conditions have been challenging, but the results are very promising. I particularly liked the Vidal and 2011 Merlot. Golden Leaf also has a restaurant that plays frequent host to large dinners and events for the local area. We were too late to try any of their food, but we look forward to checking them out on our next visit. And as we headed back to Toronto, we decided we would almost certainly be back. I’d like to visit Burning Kiln Winery, which we didn’t have time to include on our schedule, and there are so many hidden gems in the area that we didn’t get a chance to explore. In our room at the Windjammer, waiting for breakfast to start, we had flipped through a pamphlet for Ontario’s Southwest, picking out adventures we could tackle next – we definitely need to spend more time exploring all that our province has to offer. Krista Lamb is a music journalist turned entertainment publicist turned communications professional. Alongside her husband, Shawn, she writes about their adventures balancing healthy living with a passion for the art of wine on her blog Upkeep. Follow along her latest discoveries on Twitter and Instagram.